Compare Full Size Weber Gas Grills: Spirit or Summit? If you have decided to get an outdoor propane or natural gas grill for your terrace, patio, or garden, and if you're determined to get the best of the best, chances are you are considering a Weber. Indeed, Weber defines the standard of full size gas barbecuing grills. Their manufacturing processes use some of the best high quality materials and ultra modern production techniques. All Weber grills are supposed to be fully tested before shipment. Full size gas Weber grills offer a range of features to suit every cook. The most popular full size Weber grills belong to the Spirit and Summit product lines. 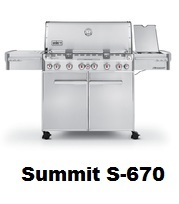 Spirit is the entry level full size Weber gas grill, while Summit is the top level as indicated by the name. Note that, at the time of this writing, all Spirit and Summit grills had received excellent reviews and average ratings of 4.5 stars (out of 5 stars) from Amazon customers who had used them. Some Spirit models are equipped with 2 stainless steel burners, others with 3 stainless steel burners. Some models come also with a side burner. Most models are equipped with porcelain-enameled cast-iron cooking grates. Some models have stainless steel rod cooking grates. All models come with porcelain-enameled flavorizer bars that vaporize fats and juices that drip down, creating smoke and adding additional unmistakable flavor to your food. All Spirit models come with electronic ignition system. Depending on the Spirit model chosen the total cooking area is either 450 sq-in or 529 sq-in. This includes the warming rack. Most Spirit models have a porcelain-enameled shroud and some models come with a stainless steel shroud. The shrouds of all models come with a center-mounted thermometer. Painted enclosed steel cabinet with painted steel door. Some models have a stainless steel door. Front access, porcelain-enameled grease tray with catch pan. 2 heavy-duty front locking swivel casters. 2 heavy-duty back swivel casters. Fuel gauge (propane models only). Some Summit models are equipped with 4 stainless steel burners and a side burner, others are equipped with 6 stainless steel burners and a side burner. More advanced 4 and 6 burner models are also equipped in addition to the side burner, with a sear station burner, a smoke burner and a rear-mounted infrared rotisserie burner. 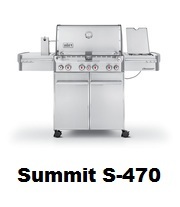 All Summit models are equipped with stainless steel rod cooking grates. They also come with stainless steel flavorizer bars. All Summit models come with individual electronic ignition system. Depending on the Summit model chosen the total cooking area is either 580 sq-in, 650 sq-in, 769 sq-in or 838 sq-in. This includes the warming rack. All Summit models come with a stainless steel shroud with a center-mounted thermometer. All models come with a painted enclosed cart with stainless steel doors. Front access, stainless steel tray with catch pan. Backlit LED tank scale display (propane models only). Grill-out handle light, an innovative accessory that features three LED lights and a tilt sensor that automatically turns on when the lid is lifted and turns off when the lid is closed. Some models come with lighted control knobs. 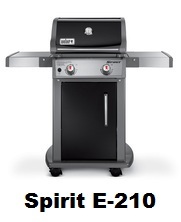 For price information or to purchase any of the Spirit grills, you just have to click below the image of the model you are interested in. IMPORTANT NOTE: When you click any of the grills images below, be sure to read if the currently available grills are liquid propane gas or natural gas (liquid propane gas Weber grills can not be converted to natural gas grills, so read well the description before buying). 450 sq-in total cooking area (primary cooking area: 360 sq-in and warming rack area: 90 sq-in). Dimensions (lid open): 63"(H) x 50"(W) x 32"(L)". Dimensions (lid closed): 45.5"(H) x 50"(W) x 32"(L). Porcelain-enameled shroud with center-mounted thermometer. 2 stainless steel fold-down tables /work surfaces. Painted enclosed steel cabinet with painted steel door. Owners guide and grilling guide. Click the above image for Amazon price info or to purchase. Stainless steel shroud with center-mounted thermometer. Painted enclosed steel cabinet with stainless steel door. 529 sq-in total cooking area (primary cooking area: 424 sq-in and warming rack area: 105 sq-in). Dimensions (lid open): 63"(H) x 52"(W) x 32"(L)". Dimensions (lid closed): 45.5"(H) x 52"(W) x 32"(L). 2 stainless steel work surfaces. For price information or to purchase any of the Summit grills, you just have to click below the image of the model you are interested in. 4 stainless steel main burners and a side burner. Snap-Jet individual burner ignition system. Stainless steel rod cooking grates. 650 sq-in total cooking area (primary cooking area: 538 sq-in and warming rack area: 112 sq-in). Dimensions (lid open): 57.1"(H) x 66"(W) x 30"(L). Dimensions (lid closed): 51"(H) x 66"(W) x 30"(L). 2 stainless steel side tables with painted aluminum end caps. Painted enclosed cart with stainless steel doors and chrome-plated aluminum handles. Front access, stainless steel grease tray with catch pan. Owner’s guide and grilling guide. 4 stainless steel main burners plus a side burner, a sear station burner, a smoke burner, and a rear mounted infrared rotisserie burner. Sear Station burner: 10,600 BTU-per-hour. Infrared rotisserie burner: 10,600 BTU-per-hour. Tuck-Away rotisserie system with flip-up motor and separate spit and fork storage. 580 sq-in total cooking area (primary cooking area: 468 sq-in and warming rack area: 112 sq-in). Dimensions (lid open): 57.1"(H)x66"(W)x30" (L). Dimensions (lid closed):51"(H)x66" (W)x30" (L). 6 stainless steel main burners and a side burner. 838 sq-in total cooking area (primary cooking area: 693 sq-in and warming rack area: 145 sq-in). Dimensions (lid open): 57.1"(H) x 74.1"(W) x 30"(L). Dimensions (lid closed): 51"(H) x 74.1"(W) x 30"(L). 6 stainless steel main burners plus a side burner, a sear station burner, a smoke burner, and a rear mounted infrared rotisserie burner. Main burners: 48,800 BTU-per-hour . 769 sq-in total cooking area (primary cooking area: 624 sq-in and warming rack area: 145 sq-in). Backlit LED tank scale display propane models only). Cookbox: 10 years, no rust through/burn through (2 years on paint - excludes fading or discoloration). Lid Assembly: 10 years, no rust through/burn through (2 years on paint - excludes fading or discoloration). Stainless steel burner tubes: 10 years, no rust through/burn through. Stainless steel cooking grates: 5 years, no rust through/burn through. Stainless steel flavorizer bars: 5 years, no rust through/burn through. Porcelain-enameled cast iron cooking grates: 5 years, no rust through/burn through. All remaining parts: 2 years. For price information on the above Weber grills, or to purchase one on Amazon, please click the Weber grill images shown above. Note that Amazon often provides a large discount on the list price of sold products. If a discount is available, both the list price and the actual Amazon price will be displayed when you click the grill image of your choice.